This is truly a wonderful B&B. We enjoyed our time here & the wonderful hospitality. The breakfasts were amazing as well as the company. Thank you so much for a great stay. It was wonderful staying here with you guys! Amazing breakfasts, amazing people, amazing city? Thank you very much for your friendly welcome. We liked the "hidden" house, the friendly and helpful hosts, our comfortable room and the delicious breakfasts. Thank you for six great days in Vancouver. Thank you so much for an incredible stay - beautiful house in a great location and the room and food were brilliant! The communal breakfast was great for meeting people too! What a find! We loved the house, the room, the food, the company, the 5 o'clock sherry, the location.....Thank you! What a super place to stay. Great breakfast each morning, a lovely surprise-wonderful innkeepers- a very high standard of hospitality. The snapshot of life that we were able to take here-especially around the breakfast table-will stay with us forever. What a blessing you’ve been to our story! The reviews on the travel sites were spot-on! What a warm, inviting, comfortable respite you both have nurtured for us all to enjoy. That you love your jobs as innkeepers shows in your attention to the little things that make the rooms so lovely and relaxing. The breakfasts were delicious, the guest fridge was so thoughtful! I will miss my electric fireplace to relax by with my evening diet coke. Thank you for making this vacation such a delight for us. What a lovely oasis you have created. The guest house is a dream to wander through and marvel at. The mix of antiques and very tasteful contemporary touches is great. I love the welcoming touches of candies, sherry, and cookies in the evening. So comforting and cozy. I loved meeting everyone. Thank you for sharing your place with us. What a delightful place you have created! Everything was thought of for our comfort. I hope we get to come back and will most certainly recommend the West End B&B! Thanks for the wonderful stay. The breakfasts were outstanding and your B&B is clearly a labour of love. Friendly and familiar atmosphere. We have been seeking for ages on Internet and hesitating between several B&Bs, but I think we found 100% what we were looking for. Many thanks to you and all the staff. Our four nights here at the beginning of our visit to Canada has certainly set the bar very high for subsequent B&Bs. We have felt totally relaxed and welcome in your wonderful house. ( I agree with a previous guest-your bedding is the best I have ever experienced!). Your attention to detail is both amazing and greatly appreciated. Your guest house is such a wonderful place to stay and you are both so very friendly and have created a very warm atmosphere-thank you very much. We will love to be back some time. Can’t begin to tell you how much I enjoyed my stay here. Love the staff! Wonderful house, great hospitality- and a super breakfast. What more could you want! This is the most perfect place to stay in Vancouver. Thoroughly enjoyed the opportunity to cycle around Stanley Park. Perfect weather for the balcony. Great hosts. your hospitality and gourmet breakfasts left us feeling truly nurtured. Lovely! We will be back! 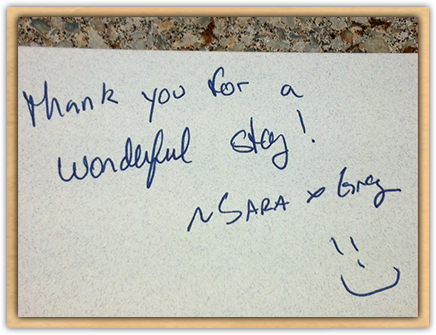 Thank you for your hospitality and providing us with such a fun and lovely place to stay. So convenient and yet so private. Our compliments to the chef for yummy breakfasts! We will put Vancouver on our lists of cities to return to. Thank you for a wonderful stay. Totally exceeded all expectations. Very grateful for such a restful sleep. Well recommend to all our friends. Everything was wonderful, from the fantastic breakfasts to the room and the homemade breads, cookies, and brownies. The hospitality was second to none! Thanks so much for making our first trip to Vancouver so memorable! We will be back! We enjoyed our stay immensely. Thank you for the wonderful food and warm hospitality.